Welcome to one of the first stops in the #Chasingblogtour for Sharon Mentyka's new book Chasing at the Surface. Today I want to share what makes this book a must-own. It is a middle grades book aimed at 8-12-year-old readers but appeals to a wide variety of people. 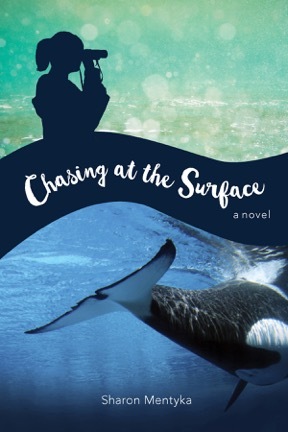 Chasing at the Surface is available this week on Tuesday, October 4th. Sharon Mentyka weaves a tale of a twelve-year-old girl who is searching for a new normal. Marisa's world turns upside down when her mother up and leaves in the middle of the night. Then, to make more chaos, her small Pacific Northwest inlet town becomes home for a pod of 19 orca whales. Marisa and her mother loved and studied whales together. They even adopted and named a whale calf upon discovering it in the area one summer. But as the days come and go the whales aren't leaving the inlet. As much as Marisa doesn't want to involve herself she can't avoid the what is becoming a serious situation. It pushes Marisa towards making a stand to help save the whales. She learns to listen to her inner voice. At the same time, she's learning some lessons about life and friends, and what makes a family. Her science teacher takes on a class project to help the crew attempting to help the whales escape. The public's frenzy of such majestic creatures escalates. The whale's food supply is diminishing. There is a growing urgency for the whales to make it. This idea for Chasing at the Surface came from a real event that Mentyka then used to build her story around. It is chock full of facts about whales, pods, whale behavior and how to exist with whales in nature. It is the perfect fiction book that could be used in schools to read and discuss the effects humans have on nature. It also hits on growing up and standing up for what you know in your heart is right. It tells readers that you are never too young to have a voice for animal conservation. Animal lovers will enjoy the details about these mammals. They will also love the passion shown to save the whales. Parents will love this book as a way to develop a child's appreciation for marine life. I am happy to say that this is definitely a book I would read to my children or save for them to read when they are older. I consider this book to have a strong female main character that moms of girls would love to have in their to be read pile. Chasing at the Surface comes out October 4th so go preorder it now. It will make a good gift for any 8-12 year old or whale fanatics in your life. Thanks again to Sharon Mentyka for allowing me to read and review her book. 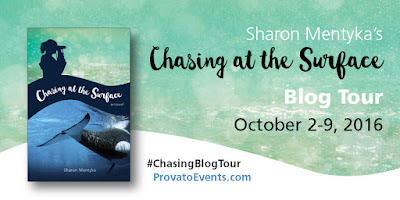 For other stops on the Chasing Blog Tour please check SharonMentyka.com.